Indian Union Muslim League (IUML) (Malayalam: ഇന്ത്യൻ യൂണിയൻ മുസ്ലിം ലീഗ്; Urdu: انڈین یونین مسلم لیگ) (commonly referred to as the League) is a political party in India. It is recognized by the Election Commission of India as a State Party in Kerala. Though Indian Union Muslim League is a Muslim community oriented party, it decided to retain its allegiance to India after independence, when the original Muslim League of undivided India went to Pakistan. The party has a stronghold in northern Kerala. They form the second largest party within the present ruling coalition United Democratic Front (UDF). The current President of Kerala state unit of Indian Union Muslim League is Panakkad Sayed Hyderali Shihab Thangal. He is considered the patron leader of the party. The Indian Union Muslim League was formed in Chennai on 10 March 1948. The IUML has been represented in the Parliament right from 1952 to present day. In Kerala, it has the led the cabinet once under the late C. H. Mohammed Koya, who became the Chief Minister of Kerala in 1979. In alliance with Indian National Congress and other secular parties, Muslim League has been an active member of the United Democratic Front. In Kerala, under the leadership of Syed Abdurahiman Bafakhy Thangal, K. M. Seethi Sahib; Panakkad P. M. S. A. Pookoya Thangal and Syed Mohammed Ali Shihab Thangal, it grew to be a major political player. The party has had cabinet positions at various times in coalition governments in Kerala, holding portfolios like Education, Home, Industries, Public works, Local administration, Social welfare, Fisheries etc. During the beginning of seventies, IUML had Ministers in West Bengal leading a contingent of seven MLAs in the state assembly. Late A. K. A. Hassanussaman was the league representative during the ministry of Ajoy Mukherjee. Apart from Kerala and West Bengal, IUML had MLAs in Tamil Nadu, Pondicherry, Maharastra, Karnataka, UP, and Assam and there were members in Delhi Metropolitan Council and Mayors in various Municipal Corporations in India. As a constituent of United Progressive Alliance, IUML assisted UPA to muster the support of the minorities and other backward communities and has held representation in UPA Government since 2004. E. Ahamed, who became the president of IUML following the demise of G. M. Banatwala, was the Minister of State for External Affairs during 2004-2009. 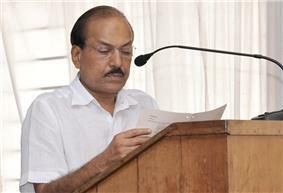 From April 2009 to January 2011, he was Minister of State for Railways. He assumed charge again as Minister of State of External Affairs on January 24, 2011. Ahamed also held the additional charge of the Ministry of Human Resource Development from July 2011 to October 2012. The party participated in the ouster of the first Communist Party of India (CPI) government in Kerala in 1959. In 1960, the party took part in the formation of a coalition government in the state, consisting of the Indian National Congress, Praja Socialist Party and IUML. The government was short lived. In the elections in Kerala in 1967, the party entered a united front coalition led by the Communist Party of India (Marxist) (CPI(M)). The other members of the front were Communist Party of India, Revolutionary Socialist Party, Karshaka Thozhilali Party (Peasants and Workers Party), Kerala Socialist Party and Samyukta Socialist Party. Muslim League had two ministers in the state government of that front. In 1969 the party left the CPI(M)-led government and participated in the formation of a new government, led by Communist Party of India leader Achutha Menon as Chief Minister, together with CPI, RSP, KSP and Kerala Congress. After the 1970 elections, Achutha Menon became elected Chief Minister for the second time. Members of the governing coalition were Indian National Congress, IUML, RSP and PSP. The Menon government lasted until the downfall of the Indira Gandhi regime in 1977 (no state elections were held in this period). In the chaos that followed, the IUML leader C. H. Mohammed Koya held the post of Chief Minister from 12 October 1979 to 1 December 1979. While the two political fronts, United Democratic Front and Left Democratic Front took shape ahead of the 1980 elections, two different sections of IUML landed up in opposite camps. A break-away faction, the All India Muslim League joined LDF and the Indian Union Muslim League joined UDF. The two groups reunited in 1985 under the name IUML and as member of UDF. In 1987 IUML left UDF for a period only to reunite later. Muslim League is among the few Muslim organizations that maintains consistent presence in the Indian Parliament. The youth wing of IUML is called Muslim Youth League and their students' wing is called Muslim Students Federation. The party has a women's political wing too – it is called Muslim Women's League. In Tamil Nadu. 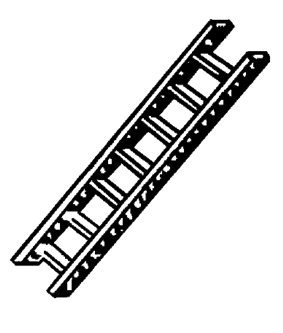 In Tamil Nadu, the party is a member of Democratic Progressive Alliance. In the Lok Sabha elections of 2004, the party won two Parliamentary seats, E. Ahamed from Kerala and K. M. Kader Mohideen from Tamil Nadu (elected as a Dravida Munnetra Kazhagam candidate from Vellore). In 2009 elections, Mr. E. Ahamed( Malappuram) Mr E. T. Muhammad Basheer (Ponnani) and M. Abdur Rahman (Vellore, Tamil Nadu) won seats and Mr E. Ahamed became the Minister of State for External affairs. 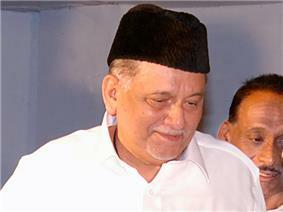 After the death of Panakkad Sayeed Mohammedali Shihab Thangal on 1 August 2009, his brother Panakkad Sayed Hyderali Shihab Thangal was appointed as the President of the Kerala State Committee of the party. IUML has traditionally performed well in Kerala state elections. IUML has three representatives in the Rajya Sabha from Kerala State. B. V. Abdulla Koya: He was one of the most reputed leaders in IUML and a member of Rajya Sabha for more than 30 years. IUML Tamil Nadu state President is Prof. K. M. Kader Mohideen . He is a former Member of Parliament. He is also the National General Secretary. The State General Secretary is K. A. M. Mohammed Abubacker. M. Abdur Rehman is the sitting MP in the Lok Sabha. A. K. Thashreef Jahan is the newly appointed convener for the women's league in Tamil Nadu. The party has Advocate V. Jeevagiridharan, a non-Muslim, as its State Secretary, proving its secular credentials. In the fourth Lok Sabha, S. M. Muhammed Sheriff was the MP from Ramanathapuram, Tamil Nadu. 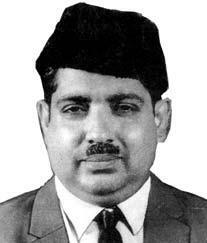 Fondly known as "Madurai Sheriff Sahib", he was the first elected Muslim League MP from the state of Tamil Nadu in independent India. In the fifth Lok Sabha, he was again elected from Periyakulam, Tamil Nadu. Muslim Youth League is the youth front of Muslim league, commonly referred as merely Youth league. It deals with issues related to the youth of India. Youth league is one of the influential constituents of IUML. The President of Kerala State Youth League is Mr. Sadiq Ali. Muslim Students Federation (msf) is the students front of Indian Union Muslim League. It has been working for more than fifty years organizing the Muslim Students on the lines of democratic, secular and progressive ideals. MSF attempts to mould the students in the Islamic way of life and imbibing them with the leadership qualities and skills to face the challenges of changing times. MSF upholds the vision of late Qaide Millath Muhammad Ismail Sahib, who masterminded the political movement of the minorities of India for their honorable existence. MSF prepares the students to carry on the mission of encouraging a vibrant community to participate in the nation-building activities. In the fifth Lok Sabha, Chowdhury Abu Taleb was also elected from Murshidabad, West Bengal. In Seventh and Ninth Lok Sabha, A. K. A. Abdul Samad was elected as Minister of Parliament from Vellore. ^ "List of Political Parties and Election Symbols main Notification Dated 18.01.2013". India: Election Commission of India. 2013. Retrieved 9 May 2013. ^ "Hyderali Shihab Thangal, chief of IUML in Kerala".